Sarah Tamir is an artisan working in sterling silver, 14 and 18 carat gold and gems. She served her tutelage as a silversmith under the renowned artist Kopievker, the renowned Russian artisan who trained in China. Sarah's style is influenced by the ancient art of Israel, Persia and China. It manifests itself in unique filigree and engravings with an occasional hint of art nouveau. 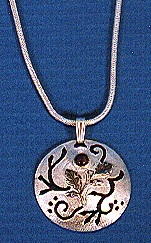 Sarah's Judaica works unite her jewelry skills with her special flare for wood to produce beautifully enhanced items. Each of her works is an unique creation, is personally signed by Sarah and comes with a certificate of originality. No two pieces are ever the same. This personal touch, naturally, enhances the value of her collection. Sarah is always open to suggestions and will produce a piece by special order. Feel free to browse the catalogue of her work, and to place your orders. Go to Order Form/Checkout to place your order.